The Wi-Fi social hotspot application that you can enjoy within the Tanaza Cloud Management platform now includes a new tool that allows users to simulate the exact Wi-Fi client login flow. Until yesterday, if you tried to open the splash page URL, you used to see the error displayed in the picture. In order to see how the splash page would be displayed to Wi-Fi clients, it was required to open it THROUGH the Wi-Fi Router / AP that was broadcasting the corresponding SSID. As quite a few Lead Users pointed out, it’s not always possible to “be there” at the customer premise, e.g. 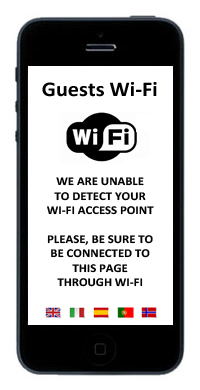 sometimes it’s required to make changes remotely and being able to see how the hotspot splash page appears in a shopping mall, in a café, restaurant or retail chain is a nice thing to have. We introduced the Tanaza Splash Page Simulator, to solve this issue. It’s now possible to bypass the mentioned error page just activating the SIMULATION MODE of the splash page. This way you can apply the latest look-and-feel to your customer Social Hotspot splash page and test it out instantly, from anywhere. This video shows how the simultator works. It is explicitly designed to allow you to test multiple times the complete Wi-Fi Social Login flow, helping you to see what the Wi-Fi client will see when trying to grant/deny permissions to Facebook, LinkedIn and other social media. It also helps you to check the different screens when using Facebook Like action, Facebook Check-In and other social login settings. At last, it helps you to configure and test the latest Abuse Control feature, in order to avoid issue with heavy users, and might be very useful if you need to ask to Facebook to review your social media application. The reason behind this is that the Splash Page needs to receive the parameters sent by the Captive Portal module installed in the Tanaza Powered APs. Those parameters include things such as the MAC address of the Wi-Fi client, the identifier the hotspot (e.g. NASID) and other items required to properly display the Splash Page. If you are interested in better knowing those parameters, have a look at this article of the knowledge base, related to the Tanza Captive Portal Specifications.